A new era is dawning for Vulcain: with the launch of the Calibre V-21, the Manufacture in Le Locle proudly presents its first self-winding alarm movement. Over 60 years after the legendary hand-wound Cricket calibre, Vulcain is taking a huge new step that is extremely promising in the wake of the brand’s 150th anniversary year. 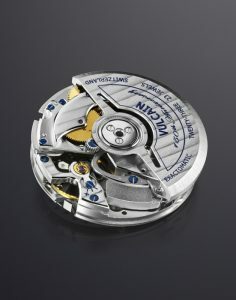 The event will be a milestone in Vulcain’s history: the Cricket Calibre V-21, the brand’s first self-winding alarm movement, will be beating at the heart of two new Vulucain models as of spring 2009. Conceived, developed and fine-tuned by Vulcain’s movement design engineers in cooperation with external developers and master-watchmakers, the self-winding Cricket Calibre V-21 is a worthy new addition to a noble line of proprietary movements. Developed on the basis of an even more accurate and reliable version of the legendary Cricket Calibre V-10, and thus representing the sum of more than 60 years of evolution and improvements, the new alarm movement shares a definite family likeness with its forebear. Like its predecessor, the self-winding Cricket Calibre V-21 is a 12-lignes (12’’’) movement equipped with twin barrels: one to deliver the energy required for the hour, minute and seconds functions; and the other to control the alarm function and its 15 to 20-second ring. It beats at a cadence of 18,000 vibrations per hour and is endowed with a 42-hour power reserve. The new self-winding Cricket Calibre V-21 is also equipped with Vulcain’s patented Exactomatic system which equalises the friction on the balance-staff in all positions by modifying the endstones of the incabloc shock-absorbers. This results in more regular amplitude and thus enhanced precision and improved regularity of rate on the wrist. Comprising 257 parts, Cricket Calibre V-21 stems from cutting-edge developments in terms of reliability and efficiency. Its oscillating weight called for a whole new going train to reduce torque and guarantee optimum winding. The unidirectional winding bi-metallic oscillating weight is equipped with ceramic ball bearings. It is protected by two anti-shock devices: a V-shaped cut in the centre of the metal enables a slight distortion of the oscillating weight in case of impact, before the latter returns to its initial shape. In the same spirit, a “pavement” on the lower bridge of the automatic winding mechanism provides the rotor with a point of support in case of impacts and thus avoids any risk of excessive tension. Also specially developed for this new Calibre V-21, the click wheel drives the barrel ratchet to enhance winding while on the wrist and enables smooth disconnection during crown winding. Boasting an impeccable pedigree as well as reliable performances, the self-winding Cricket Calibre V-21 alarm movement also features a new “hammer and anvil” system designed for the alarm function. The innovation lies in the arm which, when coupled with the hammer, strikes the “anvil” that is now placed at the centre of the movement. Vulcain’s cherished principle of double or triple-backed cases is as relevant as ever here. From spring 2009 onwards, the new self-winding Cricket Calibre V-21 movement will be powering the first two new-generation Vulcain watches: the Cricket REVOLUTION GMT and Cricket REVOLUTION Dual-Time. Subsequently, the Cricket Calibre V-21 will be featured in other new releases by Vulcain.